The open shelves in my kitchen breakfast area are one of the main areas in my home that get changed on a regular basis. The only other place in my home that sees the same amount of action is my fireplace mantel. In spite of all the stair climbing, I don’t want to leave things looking the exact same year round, so I’ve come up with a way to easily and quickly keep my shelves “current”. My trick was to create a base of neutral colored items that I could add to or slightly edit as needed. First up are my shelves decorated for winter. I was more than ready for some simplicity after their Christmas decor, so I created a “base” of black and white with a little gray and artificial greenery thrown in. 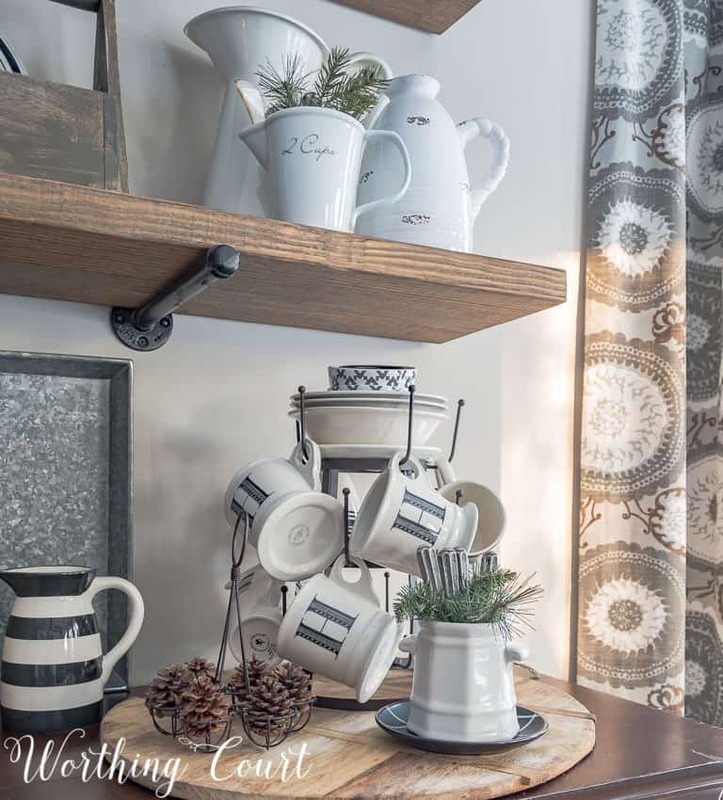 I started with a base of my black and white striped dishes and stacks of my solid white everyday dinnerware. I added two tool boxes that can easily have the contents changed out as the seasons go by. White pitchers fill the end of one shelf on the other side and down below, my mug tree is filled with monogram mugs and is sitting on a cutting board. I added an egg holder filled with pinecones and a stoneware container with snips of evergreens tucked into it. 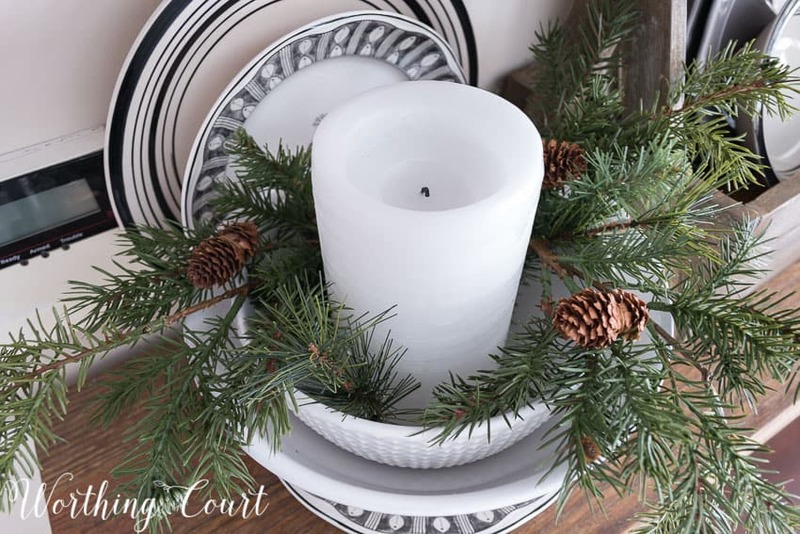 Bowls act as holders for chunky white candles surrounded with artificial evergreens and pinecones. Come back next Monday to see how I decorated these same shelves for Valentine’s Day by making just a few simple changes. I’m not sure, but I honestly think I can keep this up until it’s time to start decorating for fall again. I’ll keep you posted! Lovely! Thanks for the tips. I am trying to decorate (to a small degree) based on the season or certain holidays. I found I was getting bored with my decor, but knew it was dangerous to the pocketbook to let it get too far. This can be fun! Love your ideas, trying to decorate a small farmhouse in Georgia and you have inspired me so. My husband has no idea how much time I spend perusing your wonderful posts, gathering ideas, oohing and aahing, and making lists of ways I can incorporate arrangements and refurbish old things into new, and being encouraged to keep on with my decor addiction dedicated to making our nest cozy & inviting & comforting to us and to those who are part of our lives! Thank you for all your efforts! I am just in love with your shelves! I also have a black and white kitchen. Where did you find the stripe pitchers and containers? I have them in yellow and white and red and white. I Got them at Home Goods but have not seen the black and white. I have tried to look at the mfg. web site, but nothing. I have the small strip pitcher but would like other items as well. Any help you could send my way would be much appreciated! Love your site! So inspiring! I also have a large wreath over a cow, like your pig! Hi Joanne. So glad you like my shelves! I found the striped canister at HomeGoods. I’ve looked and looked for them online, but haven’t had any luck finding them in black and white. The black and white pitchers came from Target’s dollar spot last year. Absolutely Love Love Love this blog. Your shelves look great. I am going to put some in my kitchen this spring and need the ideas of how to fill them. Thx for sharing such great ideas. I have a large bookshelf that has been quite a challenge to get just right. It does need freshening up though from time to time, so continue sharing your wonderful and creative ideas! My shelves are in the living room so dishes don’t work as well. I have to rely somewhat on books and things to store all my my decorating magazines in to decorate with. Any help is greatly appreciated! I love the open shelves & the touch of greenery you have added. I have been rearranging things on the walls. I have found myself using more greenery here & there. Thanks! Thanks for the great tips!! love your style!!!! Love your tips. We are going to make a set of shelves like yours (thanks for the how to post) for over our small bar cabinet. I wondered if you would share how high above your buffet you hung your first shelf and the distance between it and the shelf above it. I love the spacing of yours, and that you have room to change items of varying height around. Wish I had a place for open shelving in my kitchen but I have no wall space with so many windows!! 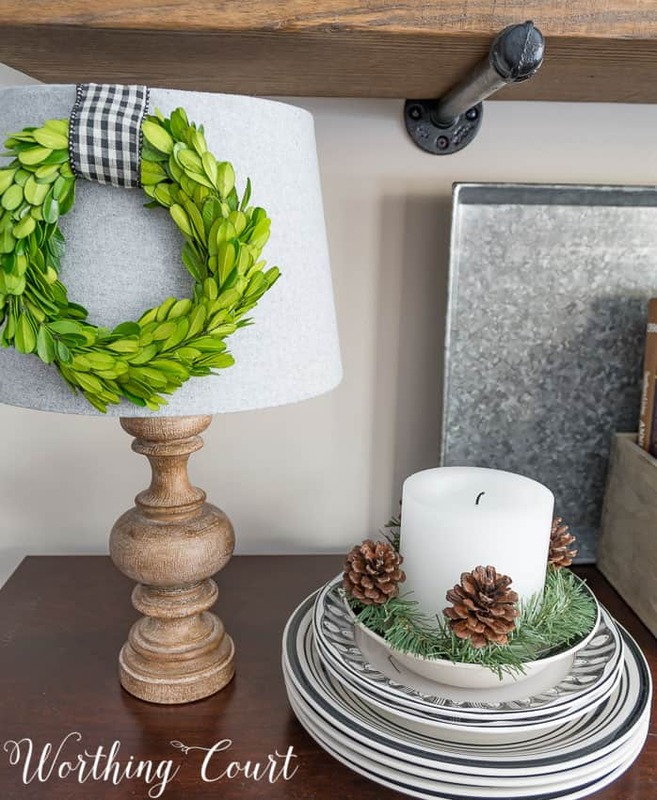 How do you get the wreath and ribbon to stay on the lampshade? Hi Chris. I wrapped a piece of ribbon around the wreath and then attached it to the back of the lampshade, just under the rim. Your shelves look amazing with every change! You must have a really huge shelf stock! Lol You always do a wonderful job! Absolutely beautiful shelves. I’m inspired to use my old tool box like you’ve done here. It’s just been sitting in the attic. Thank you for the inspiration!! I wish I had open shelves. I keep my mantle with the same decor except for Christmas. Maybe I need to rethink this. I love your ironstone, especially the pitchers. I absolutely love your shelves!!! And I love the way you’ve decorated them! Everything looks so pretty. Can hardly wait to see the Valentine’s decor. Great ideas! Am definitely going to borrow some of these easy tips. Will probably just change out pinecones for eggs for spring, and leave things until at least summer. Like you, I have to drag my stash up and down stairs! Big incentive to simplify. I love the way you’ve decorated your shelves! Gives me some inspiration – thank you! I love the black and white! I recently purchased 2 tall skinny black lanterns that I have on my hearth. I want to put something inside them besides a candle! Looking for a skinny topiary tree to fit inside. I think that would look great! Just need to get online to find what I need! Just love all your decorating, especially the small wreath on the lamp! Gosh, I would sooo love to see your “stash”! I bet it’s amazing!!! You have great taste! Love your shelves, can’t wait to see them for Valentines Day! ? 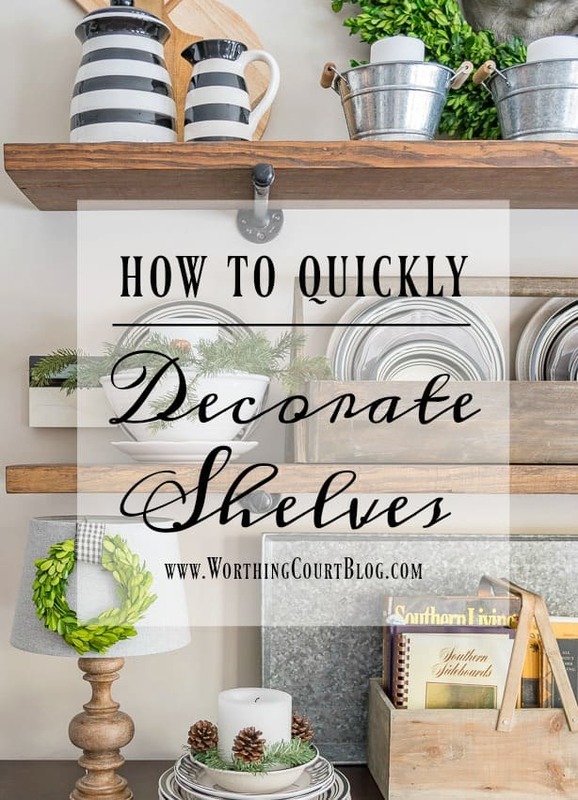 I have had my shelves in my kitchen decorated the same way for awhile. Thanks for the tips I’ll use today. I love how you have decorated your open shelving! It looks clean and simplistic, but I know it took time and effort to create such balanced layers. Fabulous! I really like the way that you decorated your shelves. Thank you for sharing the pictures. Great tips! Thanks for sharing at DIDI. Great ideas! i do something similar with silk and dried flowers. I have a base of neutral flowers in a few vases and add seasonal or colorful flowers to highlight the season. I also made a DIY burlap wreath and I add seasonal clip-on flowers. Stopped by from Family Joy link-up. I like the idea of keeping the shelves neutral and adding in pops of color that coincide with the season. For Valentine’s day. I can see adding touches of deep reds and pinks. Great idea. Love your style; I took down Christmas mantel items & immediately went to shells! They look great & mixed with some bunnies! Mix & match & do what I want. I love how you share info that is quick and easy and affordable!! Thank you so much! I love the idea of the base that you add to. I always try to re-invent the wheel and get frustrated. At some point could you share how you organize your supplies-or share that post again if you have already shown that? Hi Margaret. I’ve thought about doing a post like that, but it wouldn’t be pretty. 😀 My stash of stuff is kind of spread out all over my house. 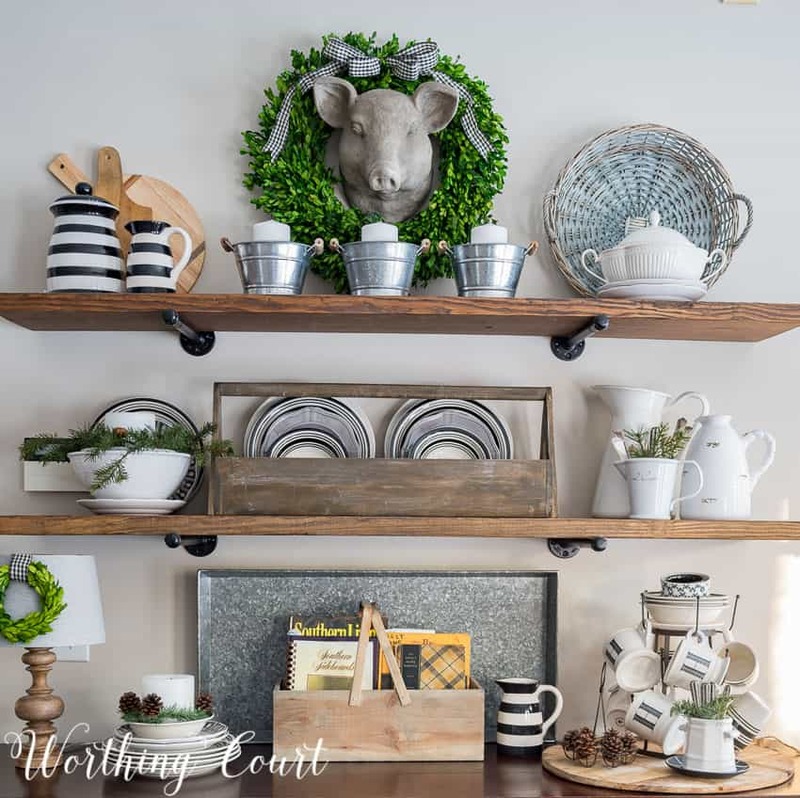 All of my dishes are stored in a closet that’s off of the kitchen, I have a walk-in closet where most of my smaller decorative items are stored and then the larger items are stored in our walk-in attic area. I love the neural, basic background and bones for the shelving that can be quickly updated for a new season with a few colorful additions! Great idea and you have some very interesting pieces – thanks for thshare! So beautiful, just love your style and all the inspiration you provide. Thanks!! 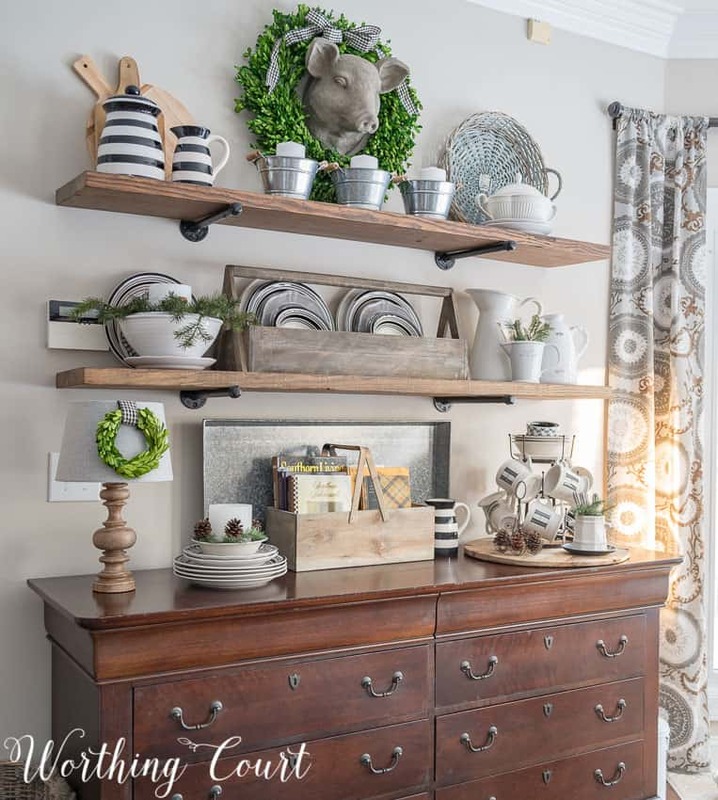 I love the shelves, do you have a diy post on how you made them? I would love to know where you got the actual shelves. I’ve been looking for a while but can’t figure out where to buy a shelf like this. I love these ideas! I love that you showed examples that really get me excited to try this myself!